eBay is taking an unusual approach to boost sales on its eBay.com marketplace. In what might be a first-of-its-kind promotion, it gave some sellers personalized sales goals along with an offer to coach them, and tied their success to a sweepstakes. eBay sent an invitation to some sellers presenting them with a sales target to reach by the middle of December and the middle of January. If they succeed in boosting their sales by 25%, their names will be entered into a sweepstakes for a chance to win some commission fee-free listings next year. 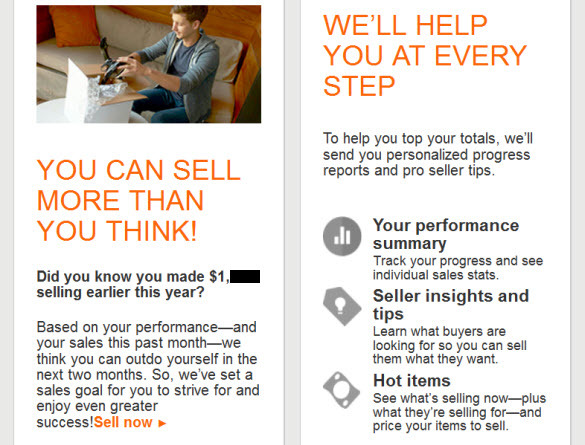 eBay is offering to help invited sellers meet the sales goals it set for them, promising to send them personalized progress reports and "pro seller tips." With sales down 95%, eBay suddenly thinks I can attain a sales goal of (close to $1500) in a little over 2 months. I've barely made more than $300 a month (down from $3000/mo back in 2012). So does this mean they are going to SHOW my listings? Are other "small" sellers receiving this? While I'll take the boost here at the year end, I'm not holding my breath. Hopefully the eBay managers who thought up the promotion have taken into account the selling limits eBay imposes on sellers' accounts. As we described last December, sellers who try to boost their sales on eBay can be stymied by seller limits eBay places on their accounts. We've got the details in tomorrow's Newsflash, in the meantime, let us know if you've received the invitation and your impressions of this motivational sales promotion. Update: Here's a link to the Newsflash article with more information. Roadmap to H*LL EBay's Outside Conltant has done extensive market research and confirmed that ALL of their SELLERS are actually College kids selling magazine subscriptions door to door on weekends. Who else could they be targeting this OFFENSIVE sweepstakes Twaddle? My gross sales$ and unit sales are roughly 1/2 what they were for 2013 with the same mix of items, same general pricing theory, and TWICE as many listings in my store Many with multiple quantities. Ebay ''advice'' to help me sell more has been Less Than Worthless up to this point. FREE shipping on low cost items is an absurd non-starter suggestion as so much of the time the POSTAGE is 40 percent or More of the SALE price of my items. Month after month their ''sales suggestions'' include just flat out SILLY suggestions that would draw exactly ZERO eyeballs to my listings. I truly PITY any suckers who sign up for this FUBAR promotion and then FOLLOW ALL OF EBAY's SUGGESTIONS. Free Shipping, Extended Holiday Returns, GSP, Trending Prices... Reads like the Roadmap to H*ll in my book. It is impossible that this is accidental or co-incidental, The proles have been shut out on the busiest posting day of they year. As of 7:30 est message boards lit up with frustrated sellers..
Like all the others above, I just laugh. Our items clearly are not getting exposure. Now, during what should be the busiest time of the year, our sales are at the worst point of the year. This leads me to believe that once again eBay has manipulated search in favor of large sellers. What did Ming call it---a rigged card came. 100% accurate. As someone stated above, eBay management live in a dream world and they are completely out of touch. Do their so-called consultants sell anything on eBay? Those who do, do. Those who can't do, consult. Go F@#%K yourself ebay. We don't need motivation or coaching. We need people that know how to turn around a broken eccomerce venue. You idiots really don't have a clue. Treat sellers like scum, and then tell us we need motivation...FFFF you! I'd gladly enter a sweepstakes to motivate John Donahoe to make an early departure. Motivation instead of iron fist is nice to see. Every time I've talked to a CS rep about an issue, which is usually due to low DSR's with great FB, the CS rep has told ME to ''TRY HARDER''. They have told my sister and friend this also. I'm sure that's what they have in mind with their ''pro seller tips''. ''Learn what buyers are looking for'' - Ebay thinks everyone is looking for a freaking cell phone! I don't care about the ''hot items''; I have my niche & it's mostly used, but things people buy if they can SEE them. Wenig - It's time for YOU to TRY HARDER! If this is YOUR best, you should try using your own product and sell an item! If you want to give advise to sellers - you should ask some of your AMERICAN large pro sellers for advise before you give it to us, because we can smell BS a mile away & we know how to sell if you would just get the hell out of our way and get out of OUR business! Go back to being a FORUM - look that up in the dictionary. Mass Howler - good one! Nice chuckle this morning, but right on. A lot of sad reading how many sellers have, like myself, watched our sales peter out to near nothing since 2012 eBay “Black Plague” of death on small sellers. As for me, I am almost giddy with a recent up surge in sales over the past ten days. From zero, I am experiencing 1 to 2 sales a day. Heck, Saturday, I even sold an item on Etsy. The Christmas Rush! Maybe another three weeks of surging sales, and then it is back zero. Fortunately, I did not receive an invitation to participate in motivational promotion. Just more fluff from a company that has forgotten who made it rich in the first place. Benign neglect would be a nice Christmas gift from eBay crack management team! That's going to be hard when you have no buyers. I wonder how they plan to accomplish this? They really are living in eBayland. I placed my store on vacation indefinitely, which will more than likely be permanently. What a train wreck eBay is. I don't know if i ever got the invite. I delete most of ebay's messages without opening especially if they are titled "Tips on Selling", etc. I vaguely remember one that mentioned a sweepstakes prize but didn't open that one either. i have been getting popups while i list and relist like "not enough keywords in the title", "lower your price" "raise your price", "offer free shipping" which I also ignore. Wish I could send a couple back to them like "fix search" "advertise to bring in new traffic", etc. When an item sits on Ebay for a couple of weeks with NO views and the I place it on another site and it gets views and sells....then its Ebay who needs the lessons and not me! I would return to Ebay in a HEARTBEAT if it all went back to the 2001 layout. I did Very Well. Then Donahoe dropped the bomb. P.S. "Retro Economics" is trending now. News Flash ebay, if you just showed our listings for the duration of the auction / fp we paid for and not manipulate search, we'd all sell 100% more. Advice offered by eBay is worthless at best. I've done everything that I can do short of signing up for free shipping and soliciting rentals. We're now at the mercy of factors we cannot control - a broken search engine, buyers leaving, etc. Although the trend for me has been upward, it's clear that I got back into this at the wrong time. My sell-through rate is abysmal compared to when I was just a kid parting out lots in the late 1990s. After Christmas, I'll have to cancel the store and see if any sales trickle in under the auctions-only absurdity. At the staff meeting where everyone was brainstorming on how to improve eBay's profits, *this* idea was the one that edged-out ''having a bake-sale'' and ''let's do a car-wash''. We know what eBay doesn't know, or can't figure out, or refuses to admit. Namely, that the root of their problems are much deeper and widespread than can be solved by ''motivational gimmicks'' like this one. How about a promotion on ebay where we can earn AMAZON gift cards- LOL! They need to spend their money hiring software people who actually know what they are doing. For many folks the site has been non-functional for most of the day. Just pathetic. Along with all the other nonsense, software bugs are now the norm at the new eBay.